Safari Ecology: Butterfly migration out now! A blog about ecology of the savanna biome and other regions of interest to safari guides and visitors to East Africa. If you're anywhere near me at the moment and it's not dark, get off your seat and look outside. 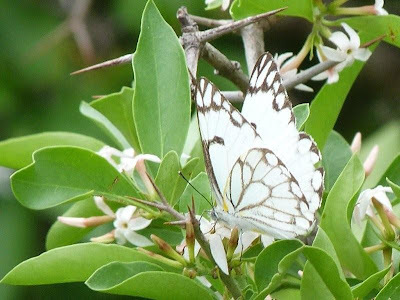 There is a phenomenal butterfly migration happening in the Arusha area at the moment - from my garden in Ilboru I'm counting around 100-150 white butterflies headed west over a 20m wide patch of sky every minute. Truly spectacular! I'd love to know how widespread the migration goes, so if your on safari and getting this on your mobile, let me know what's happening where you are too. I first noticed the movement yesterday and expect it will keep going for a while yet. 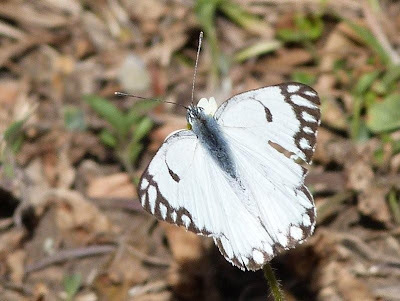 The butterflies involved all seem to be the African Caper White B. aurota, though there could easily be some African Common White, Belenois creona (subspecies severina) in there as well. 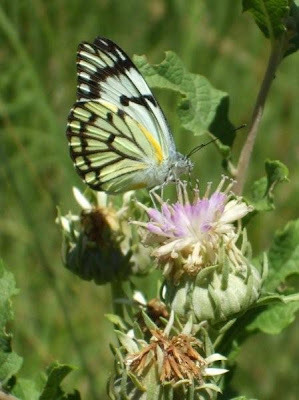 Look carefully for a while and there are one or two of the African Migrant Catopsilia florella a much larger and yellow tinged butterfly. The main difference between the two Belenois is that the male in the Caper White has a bar on the forwing and the Common White just as a spot - but it's not always easy to decide if it's a spot or a proper bar as there's lots of individual variation, so I might have got a few pics confused here. Let me know if you're better at these butterflies than me! Belenoisa aurota African Caper White on the move now! Migrations such as this happen every year to a certain degree, but in varying numbers - last year there were no major movements, two years ago we had something similar to this. These Belenois species all feed as caterpillars on members of the Capparaceae, for which they're often given the name Caper butterflies. The most common food plants in that family here are Maerua and Boscia species, and there's lots of those in the Maasai Steppe. Migrations like this have been recorded at erratic intervals for a very long time -I found a couple of old papers describing migrations of these species from the 1930s at a variety of times of year and with animals heading in a variety of directions, but nothing that really tells us what's going on in any detail. It's hard, really, to call such erratic migrations - they're probably moreproperly called 'erruptions' - when the population reaches a particularly high level and there's not enouch food the population en masse heads off to find new foraging grounds. Other species do proper distance migrations too, of course, and I'll have to tell you about the Painted Lady Vanessa cardui some time, populations of which migrate from Europe to Africa and back again (other populations do a North American migration). But that will have to wait for another occasion, today is the day of the caper whites and erruptions! 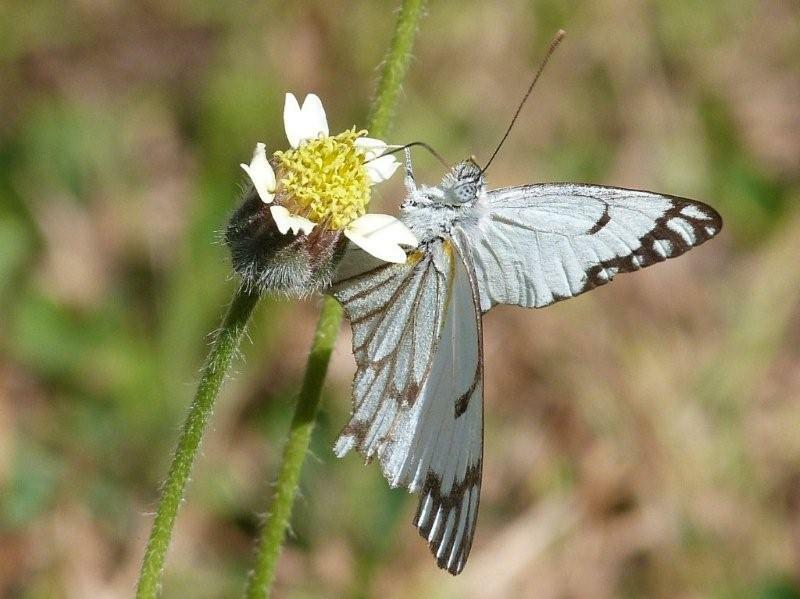 When they arrive in huge numbers their larvae have a massive impact on the food plants - they can completely defoliate (remove all the leaves) from thickets of Maerua, and substantially change the vegetation dynamics of the areas they settle. 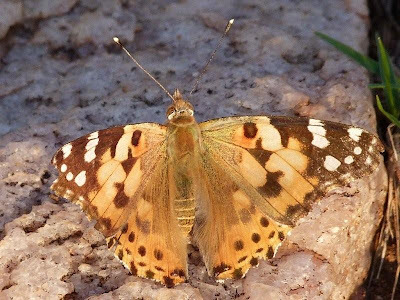 Such events no doubt give other species the chance to establish in the gaps that form and promote diversity in the system as a whole, but clearly show how the notion of 'balance' in nature is a myth - ecological systems are a complicated and dynamic system constantly changing, sometimes rapidly and dramatically. Belenois creona - note the spot on the forewing, not a bar. UPDATE: Check the next post for an interactive map to add your sightings to! Thanks Arnold! Having started working my network so far I've discovered they're moving NW along the Pare mountains in middle sized numbers, heading west over Moshi and Arusha, carrying on west over Manyara but by the time the reach Eyasi they're heading South and I lose the trail there somewhere! No large numbers reported from central or western Serengeti yet, so that fits. I'm trying to find contacts further south and east to se what the story is elsewhere. I'll have an interactive map online somewhere soon, I hope - just been asking for help from some tech guys... Social media should let us learn something about this! Thanks! Can you tell me where you are in Kenya and I'll add the observation to the map? Or feel ree to do so yourself. There are still some moving here and thfirst reported from northern Serengeti yesterday! I am in the west of Johannesburg and see the movement too! Hey all. We are in the Groot Marico area in North West Province and there are lots of butterflies here too. They seem to be going in a northern direction. I think the migration is more due to over population than a shortage in food resources as we had very eradic rainfall in the last month or two. Perhaps the rainfall and temperatures are also linked to their hatching numbers? Any thoughts? Mariante. We are 30 km north of Modimolle / Nylstroom. Migration been going for the last 7 days in a NE direction. Literally thousands upon thousands flying through the gorges. A site to behold. Have heard they are headed into Mozambique. Follow Safari Ecology on Twitter! Why is the African Savanna so full of thorns? How the zebra got his stripes? Why do savanna trees have flat tops? Why is snake venom so toxic? This blog is written by Colin Beale and Ethan Kinsey (hopefully with contributions from others in time!). We hope you find what we've written helpful and interesting, but the copyright is ours and we'd be greatful if you'd let us know if you want to use bits of it elsewhere. If there are topics you'd like us to cover in the future, do let us know! If you want, you can go on safari with Ethan - go to his business website here, or study with Colin at York!